"Probably, the most revolutionary thing you can do on this earth is grow a riot of color." Andrew Michael Clements, the 40-something, now Greek, originally English inventor of several approaches for transforming Greece's flat roofs into climate-altering natural riot-of-color ecosystems, isn't just another "back to the land" type who's retreating from the world to grow satisfying cabbages with his beloved. In fact, he is suggesting we bring the land back to the city. He has a vision of Athens as a city "lost under an endless, natural, Greek meadow with the spectacular hues of tiger swallowtail butterflies and ladybugs, dulcet tones of robin redbreasts and yellowhammers, and the subtle aromas of sage and thyme, wafting in the breeze." A city that has freed itself from ever-increasing energy costs and eliminated the "vicious circle of using air conditioning, which actually raises ambient, summer city scorching heat, in favor of a virtuous circle in which air conditioners are unnecessary." Green roofs have been around since the Hanging Gardens in Babylon, but in the modern era they were made briefly fashionable by Le Corbusier and the Bauhaus movement in Germany, Austria and Switzerland. In the '60s, interest revived in the same countries and now more than 10 percent of all flat roofs in Germany -- 50+ million square meters -- are planted. Ironically, though, they were unknown, in their modern form, in Greece, which has a far greater need for natural cooling, when Clements began the search which led to the founding of his company, Oikosteges (Ecoroofs). His quest started in 2000 when he bought a 120-year-old house in the mountains above Corinth in the northeast Peloponnese and decided it should have a green roof to insulate it from the fierce winter cold. He travelled to Central Europe and met the "movers and shakers of the industry," none of whom were particularly interested in starting up something in "such a small market." Upon his return, even more determined to make it happen, he called upon friends -- engineers, landscape architects, botanists, architects -- and expert members of the Mediterranean Garden Society for help. I was a financial consultant when I discovered Greece on holiday 25 years ago. I fell in love instantly and irrevocably first with a girl, then with the country and the people and went back to the City, packed my bag, and moved here. Until I founded Oikosteges, I taught English in Athens and even started my own language school, but I'd always loved nature. Born in Rugby, and growing up in the heart of rural England during the reign of Margaret Thatcher, my family, friends, and British culture as a whole were business and sport oriented. Conversely, I had an affinity for growing things, and had my own marrow patch by the age of eight. As we sit outside a Starbucks café in the middle of the smart district of Kolonaki in central Athens, fittingly on Earth Day, Andrew's gray eyes shine with enthusiasm as he takes me on a whirlwind inventory of Greece's mineral and botanical wealth. The truth is that Greece is paradise. You know the old story about the Creation? When God was handing out resources to all the nations, he got to the end of the list and realized that he'd forgotten Greece. 'How could I do that? The country will be giving so much to civilization, I'll reward it with a piece of Heaven.' And that is why Greece has everything, just in small amounts. We have countless ecosystems and micro-climates here -- deserts, Alpine mountains, Siberian tundra (in northern Macedonia), even subtropical areas -- and one-third of all the plants found in the whole of Europe. Add to this biodiversity, amazing mineral wealth, from bauxite to pumice, uranium to gold. That was a tall order. Our first priority was, of course, safety. We had to devise the lightest material possible, and we have -- it's only 20 kg/ sq m, and that's the lightest surface that exists. We also had to make it waterproof -- no leakage allowed -- resistant to seismic tremors, able to survive the summer meltemia (north winds) of 60 km/hour at 40°C which are the equivalent of a monumental hairdryer, not to mention the monsoon type rains we get in winter when 15 mm can fall in 15 minutes after six months of drought. But we solved all these problems and eight painstaking years after the Odyssean type adventure began we made it to our Ithaca. 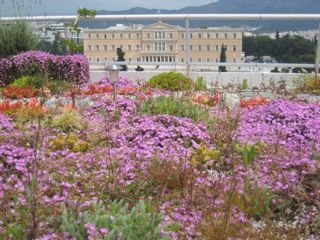 The Ministry of Finance on Syntagma Square commissioned us to plant their roof. Now, that project is one of the flagship projects, for the industry, around the world, along with notable pioneering works such as the Chicago Town Hall and the California Academy of Sciences. It has already saved the Ministry thousands every year in air conditioning and heating bills. As a side benefit, the roof not only repels pigeons, it has actually attracted myriad butterflies and song birds back to the city center. Oikosteges offers different installation approaches depending on whether the client is building from scratch or wants to plant an existing roof. In the latter case, they use portable "cushions" made of a weatherproof geo textile which are filled with a rich, inert mix of Greek minerals. You slit them open, stick in a plant -- a hardy herb or low shrub -- and that plant will never need fertilizer. From the outset, the system barely needs watering, and even less so after the plants are established, since the substrate they grow in has the capacity to generate dew. But, speaking of the crisis, we've adapted the Greek way of approaching life 'siga siga' or slowly slowly. Just as the countryside is full of buildings that are being built in stages, a person can install the cushions a few at a time. Even that will be beneficial. For example, a frail old lady in Central Athen who hates air conditioning had us create a roof for her of strawberry plants. She can't negotiate the steep stairs to see them but we harvested a big bowl for her and she has turned off her a/c. 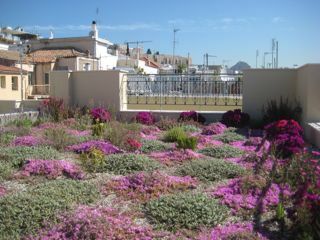 Oikosteges has won lots of support in Greece -- its Facebook page, Green Roofs Greece, has 22,000 members. And Clements is working with other like-minded individuals, including Spyros Kouvelis, former junior minister for Foreign Affairs, who is developing the campaign, "Greeks Can!" to promote Greece as it really is, not what popular opinion thinks it is. I believe humanity is at a crossroads. I'm not an ecologist, and I don't agree with ecology. Our planet does not need saving, it's been through much worse than we could ever throw at it. We need to save ourselves and the only thing that can save humanity is nature. Nature has a 15 billion year old R&D department we can learn from. The greenest energy is the non-use of energy. By growing things and growing them in unconventional places, we can reverse some of the damage we've done. After having completed countless projects of varying sizes in Greece, Oikosteges is now ready to export its know-how to other countries with similar climates. They are already working with other Mediterranean countries and plan to expand into the Middle East and even the United States. Oikosteges is quietly transforming Greece's bare concrete slab roofs into biodiverse, abundant, natural ecosystems, one square meter at a time. The process is well under way and gaining momentum. The Oikosteges story can inspire and act as a model for cities worldwide. Roof greening is one way that we can restore our beautiful planet to its original pristine beauty. Clements modifies Gil Scott-Heron's quote to, "The Revolution isn't being televised," but he says it IS happening. And it is happening in Greece, the place where so many important contributions to humanity originated. Photos courtesy Oikosteges photo archive. For an English version of the website, please go to www.vveco.eu.